This blogpost includes products which I’ve been gifted, however all my opinions and views are 100% my own. I’m bringing these damn good smoky braised eggplant tacos which made a pretty exciting feature in the most recent Eat Well Magazine! The braised eggplant are the stars of the dish, it’s one my mum and I have been making for a while now but never measured and wrote down the recipe. If you think you aren’t a fan of eggplant, I urge you to just give eggplant one more chance and give this recipe a go. Then you can tell me if you are a eggplant lover or hater. The marinade beautiful braises the eggplant into tender, creamy and smoky bites of heaven and when paired with crunchy bites of veggies in a corn tortilla, I can guarantee you will be going back for more. The marinade is compromised with one of my favourite kitchen staples- Niulife Cocoamino BQQ Sauce. I made this recipe in collaboration with Niulife however, I genuinely love their products and use them all the time (and I mean it.) I also used their coconut balsamic vinegar which is tarragon infused (yup, just as good as it sounds!). I hope you enjoy this recipe and the tacos! Trust me, those eggplants are next level. Heat a large frying pan to medium-high and add ½ tbsp of coconut oil. Cook eggplant slices, in two batches, for 5-8 minutes or until golden brown on each side. Transfer first batch onto a plate and add the remaining ½ tbsp coconut oil and cook the second batch. Transfer to plate. To create the sauce, combine all sauce ingredients and mix well. Transfer all the eggplant strips to the same frying pan . Add the sauce. Reduce the heat to medium and cover the pan. Let eggplant braise for 15 mins or until tender and liquid is lightly reduced. Once done, turn off the heat and let eggplant sit in the pan with the lid on for a further 5 mins. 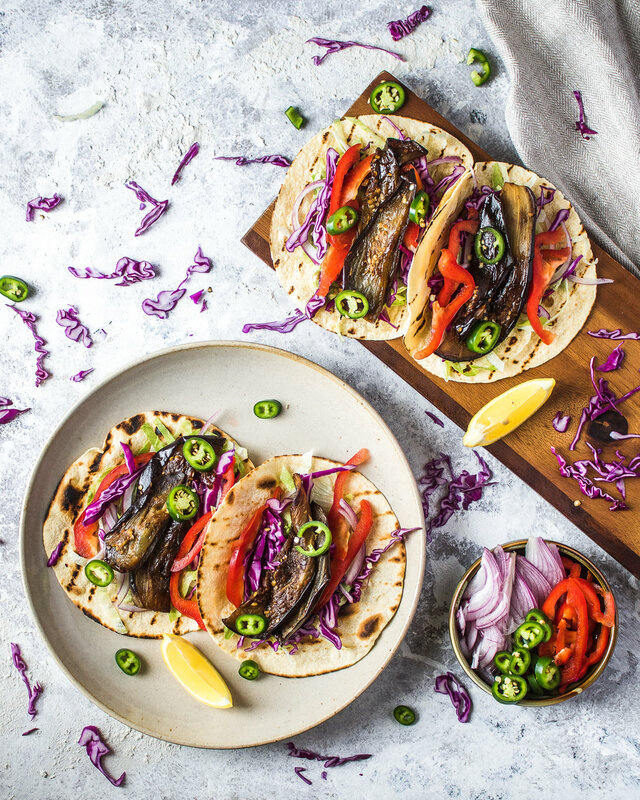 When ready to serve, enjoy the braised eggplant on grilled corn tortillas with shredded lettuce, red onions, red cabbage, julienned red capsicum and green chilli (optional) . Enjoy!